​The Ecommerce version of SMB Webworks includes all of the features of the Marketing Version PLUS a full shopping cart (ecommerce system) AND member management system. With this package you can sell unlimited physical and digital products, through a seamlessly integrated shopping cart. The entire site is SSL encrypted and PCI compliant, It's now easier than ever to set up online sales for your small business. All of this based on an affordable low cost setup fee and low monthly hosting fee - with NO percentage of sales fees. Website Design Fee: $2,800 billed in two installments: $1,400 up front and $1,400 when the site launches (or at 4 weeks from start - whichever comes first. Website Design Fee: $255 per month for 12 months starting on the day the agreement is signed. Provide shoppers with the convenience of a fully integrated free shopping cart and a secure checkout (SSL encrypted) experience directly from your ecommerce website. 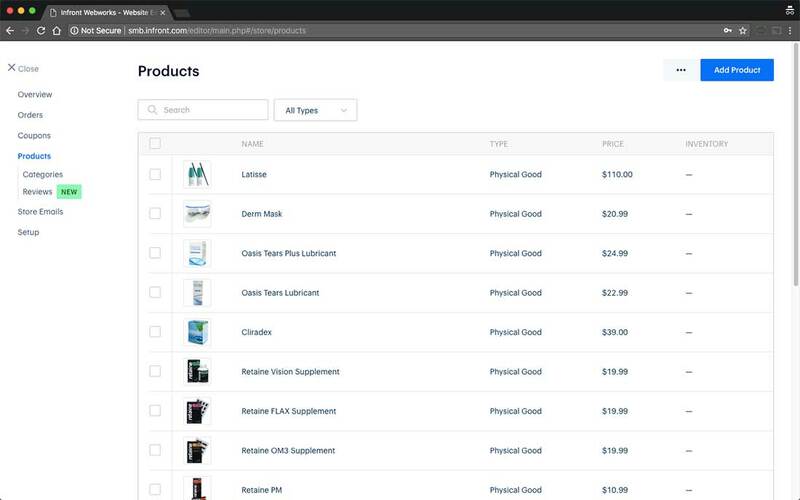 Our shopping cart software is set-up automatically when you create your store so you can start selling online immediately, with no technical skills needed. Give shoppers a mobile experience that works every time from any device. We ensure your online store and products load quickly and display perfectly. All ecommerce websites include a free mobile shopping cart and secure checkout experience that’s designed to work perfectly on smaller screens like phones and tablets. We offer flexible options for selling a wide range of products. Digital and downloadable items are automatically delivered to your customers via email with a secure one-time use link. There are extensive options for physical products, one-of-a-kind handmade items, services and donations that can be completely customized to meet your needs. Store management is all done from an easy to use web interface. Our ecommerce websites are designed with search engines in mind so customers can find you. We automatically do basic optimization of your product pages so you’ll have everything you need to start ranking for search results (in-depth search engine optimization requires an SEO package). It’s simple to manage even the most complex tax situations with a SMB Webworks ecommerce website. You determine when and where to apply taxes. SMB Webworks provides and maintains current city, state and province level tax rates for the United States and Canada. For all other countries, tax rates can be defined by the seller. Instantly accept major credit cards directly from your own domain name. Choose from Stripe, PayPal, Square and Authorize.net payment gateways. The SMB Webworks ecommerce platform brings the ease of drag and drop website creation to product merchandising. Create rich product descriptions with slideshows and videos. Easily reorder products for maximum visual appeal. Shoppers can easily share your products on Facebook, Twitter and Pinterest. Combine content and products in unique ways to create more buying opportunities. In addition to a powerful storefront, SMB Webworks gives you the freedom to showcase and sell products or accept donations from any page on your site such as a blog or your homepage with our standalone ecommerce element. Sellers are armed with promotional offers to compete effectively and increase sales. Incentivize visitors to purchase with a limited-time offers, attract new buyers by offering a referral discount and generate repeat sales from existing customers by running a sale. Instantly turn your website into a powerful "intranet" for your clients or members. The Member Management function of your ecommerce website allows you to publish password protected content to individual users or groups of users. Create unlimited members (clients) each with their own unique username / password. Create unlimited groups of users so you can easily publish protected content to multiple users. We use a rock solid web hosting platform that powers roughly 2% of the websites on the Internet. Your website will live in multiple data center locations to offer superior up-time, response time, speed and reliability compared to most any other hosting option. The data center features a redundant, cloud based hosting infrastructure which ensures optimal performance and provides a fluid online experience for visitors to your web site. With a traditional web host your site shares disk space and CPU power with dozens or sometimes hundreds of other customers on a single server. If one of those websites experiences a notable traffic spike, all websites on the server can slow to a crawl. With SMB Webworks, your ecommerce website is served across the entire server infrastructure that powers millions of websites and pageviews per day. If your website is featured on CNN.com, it won't cause as much as a hiccup in your site's performance, or the other websites hosted on this platform. Your site loads fast and remains live under any condition. SSL Encryption - the monthly hosting fee includes SSL Encryption of the entire website AT NO ADDITIONAL COST. Don't need ecommerce? Check out our Marketing version. Let's Get Your Site Built! ​Affordable web design and online marketing services for small businesses in Colorado Springs.